"We're working our way up the side of this volcano and all of a sudden it does this big burst and you see this thing the size of a school bus comes crashing down about 150 metres away from us. I kind of stop there and we're all quiet—we don't scream or anything, but I look up at the guys, they just kind of shrug their shoulders and keep going … and I'm like: 'Does anybody want to talk about what just happened here?'" Read more about Canadian digital artist and filmmaker Michael Dalton-Smith and see some of his stunning up-close shots and volcano footage. 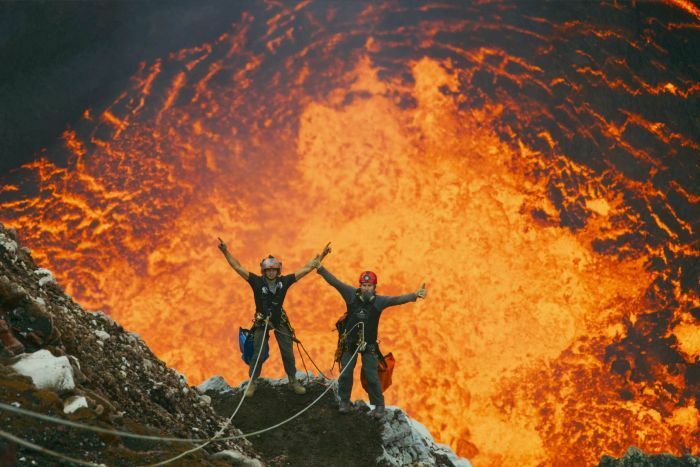 The project was part of a new film titled Volcanoes 3D, which premiered at Melbourne Museum's IMAX cinema this week.